Durham Attack 18U Girls Win Silver! On Saturday, December 15, Durham Attack’s 18U Girls’ Team played in their first OVA tournament of the season at Niagara College, in Welland, Ontario. To recap, this team finished a very successful season last year with a Gold Medal win at Provincials and a National title at the National Championships in Toronto, Ontario. They were seeded first going into this tournament with all the Premier teams and knew that they had their work cut out for them. The D.A. girls started Pool Play with their first match up against Ottawa Mavericks who they easily beat at Provincials last year. 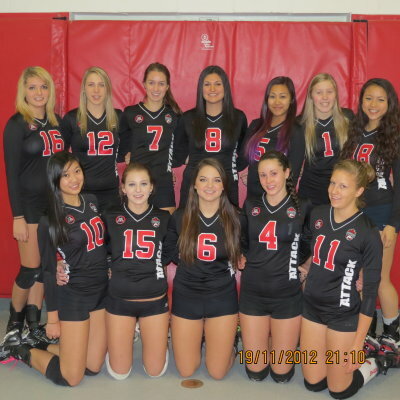 Ottawa came out much stronger this year, and Attack lost both sets 18-25. The next match was against the Toronto Diamonds. Attack lost to this team at Provincials, but beat them in two sets at Nationals, so it was hard to foresee what would happen at this re-match. Unfortunately, for Durham, they lost two close sets, 21-25 and 24-26. Having lost against both teams, this put Durham Attack last in their pool, but because they were seeded first, they still advanced to the Quarter Finals, but were given the more difficult route. They were next up against South County Bandits who they also met up with in Quarters at Nationals, where it took three sets to beat them. This time, there was no contest. Durham Attack took both sets easily (and hungrily) winning 25-12 and 25-16. The Gold Medal match took the Attack girls up against the Eclipse East team from Toronto. This is a team Durham has struggled somewhat with in the past, but has never given up a match against. Well they were taken by surprise, when Eclipse gave it their all, and beat Durham in three sets (25-23, 25-27, and 15-9). Still, a great start to the season it was with a Silver Medal win for this AWARD WINNING TEAM! Congratulations to Coach Kevin Hellyer and his team of amazing athletes: Anna Aguayo, Jaime Fryer, Ashley Hart, Julie Longman, Olivia Michaud, Nicole Mironov, Paige O’Leary, Layton Risto, Callan Rolfe-Hughes, Caitlyn Tam, Kristine Yan, and Michelle Yu.